Everyone is using social media these days- and some are doing it better than others. Social entrepreneurs in particular are taking advantage of the audience, reach, and potential virality of the vast array of mediums to spread the news for better results, and longer-lasting initiatives. What exactly is a social entrepreneur? The Schwab Foundation defines social entrepreneurship as practical, innovative and sustainable approaches to benefit society in general, with an emphasis on those who are marginalized. The people dedicated to finding these approaches usually identify problems and kick off entrepreneurial endeavors to solve them. The term “entrepreneur” is used because instead of just conducting a small operation, these people actually make full companies that aim at changing society. They usually influence fields ranging from education and health to environment and enterprise development. Just like entrepreneurs change the face of business, “social” entrepreneurs change the face of society. So why should such social entrepreneurs use social media? 1. Communication: A powerful tool, social media, at its core, is a conversation medium that enables people, brands and companies to interact with their target audiences in a meaningful, personalized and helpful way. Today, no business can survive without a powerful online presence, and social entrepreneurs know this to be true. They are using social media for a variety of purposes such as raising awareness or empowering their audience to change and participate in their efforts to make a difference. 2. It’s cost effective: Social media is a low-cost tool that enables people to communicate with a large audience. Social entrepreneurs share meaningful stories and report on their activity, dispersing through networks and varied channels. Many have adopted blogs, which are great to talk about values and updates. On platforms like Facebook, Instagram, and Twitter, they share pictures of themselves or their staff in action, getting their audience to connect with them while discovering what they do in the field. This is a key point for these organizations because talking about a cause is nothing compared to doing something about it. 3. Balancing act: One challenge is maintaining a balance between communicating their cause and communicating their activity. If they talk about their cause too much, it will look as if they weren’t doing much, and if they talk about their activity too much their endeavor loses context. Social entrepreneurs also take advantage of social media to raise funds and rally others to their cause. To this end, they run campaigns with creative ideas that aim at raising both awareness and funds. Social media is now an essential tool for every business, even if they’re in the business of changing society. Social entrepreneurs are actively making the world a better place not only by taking action, but also by using social media to educate the general public, and to raise additional funds. 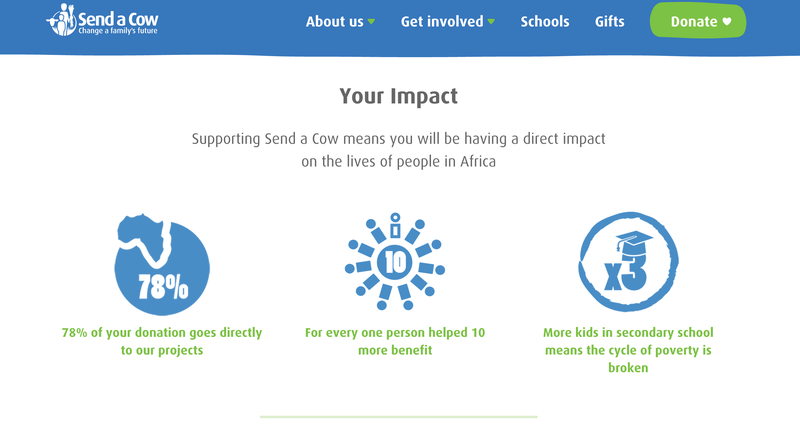 Screenshot of the Send A Cow website. Send A Cow is one example of a social entrepreneurship organization that has been doing social right. Send A Cow is an organization that aims at helping African farmers get more productive thus raising their revenue and enhancing their quality of life. They do so by teaching them how to optimize their workflow and implement durable change in the worker’s daily life. Send A Cow produces videos explaining what they do and reporting on their ongoing activity. They measure the impact of all their endeavors and develop graphic interpretations. They share all that info on their Twitter account and Facebook page with candid pictures of the people they help and feature a “supporter of the week”. Not only do they educate their audience about their cause and their actions, they also reward their best enthusiasts which makes them feel valued and drives them to do more. While not social entrepreneurship, a number of online campaigns by global entities are worth mentioning. The Blue Key is a campaign launched by the UN Refugee Agency (UNRA) to raise funds, awareness and advocates for their cause: helping refugees live in better conditions. They have a web portal on which they explain their actions, measure their impact, share statistics about refugees around the world, and a lot more. You can buy your Blue Key online, gather information through their e-book, view all publications and videos- it’s a centralized information hub from which all data and media can be shared. Their Facebook page is very active with daily pictures of refugees sharing their story and branded images of their volunteers talking about their experience on the field. The United Nations High Commissioner for Refugees (the UNRA parent organization) has a great YouTube channel on which they publish poignant documentaries and personal refugee stories, then spread them across the web. You need to check the UNRA’s Twitter activity to really appreciate their online efforts. Not only do they post about themselves, but they also retweet a lot of posts from partners, similar organizations, influencers and people who mention them. They organize recurring “Tweetathons” where users get to donate online and where a “Champion” is nominated at the end. This operation was their biggest as it boosted both awareness and sales in ways they ever even conceived, in part thanks to the “trending” feature of Twitter.